The predictability of the Russian ruling system leading to Vladimir Putin running for 2012 presidency will most likely be welcomed by the world community, head of the State Duma Committee for International Relations, Konstantin Kosachev, told RT. ”I am not in a position to speak for the West, but I believe that predictability and transparency in what we are doing here, inside of the United Russia party, inside of the government, the Russian ruling authorities, is to be welcomed by anybody else in the world,” he said. ”To have this strong combination of those two leaders continuing to work together with each other, now in other capacities but still together, is good for Russia, is good for the Russian foreign policy and, I believe, is good for the world,” he concluded. Fred Weir of Christian Science Monitor told RT that Putin re-occupying the President’s seat will not be the worst option for the West, where he is already known as a partner. 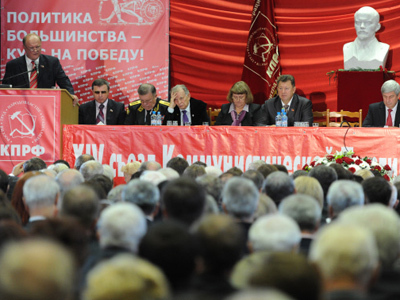 “People will become more certain that there is one system of power in Russia and it is there to stay. That is the message to the world, but it is not a bad message. Despite some of the trouble during the Putin era, Putin was a kind of solid, predictable partner. He is a known quantity,” said Weir. According to John Laughland from the Institute for Democracy and Co-operation, the recent move by the tandem was long expected. Laughland observed that the relationship between Vladimir Putin and Dmitry Medvedev over the past several years has been a positive one. VTB President and Chairman, Andrey Kostin, believes that the announcement is good news for the international investment community in a very difficult time. 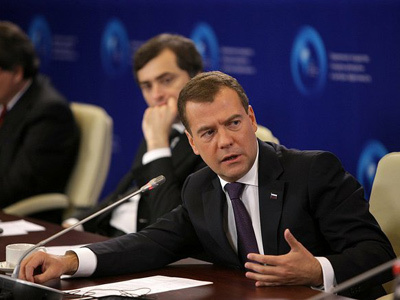 “And I think that continuity of the economic course – Mr. Medvedev will be a Prime Minister – is also a quite exciting decision,” he added. He added, though, that the markets are “really crazy” right now and ignore “many positive things,” which are happening in the world and particularly in Russia. ­Adrian Pabst, University of Kent professor, told RT it has been clear for months that Dmitry Medvedev would not run for the Russian presidency. “I think since July Medvedev has given up fighting for the presidency and his mentor was going to return to return to his job in 2012,” he said. Pabst agrees the home policy Vladimir Putin has tried to implement is a clear shift to what President Medvedev was trying to do in the past four years. On the other hand, Pabst added that he does not expect a major shift in foreign policy. “There might be a slight change of tone. Putin in the past used some rather strong language, but over time his tone has changed. But no big shifts will be seen in the issues. 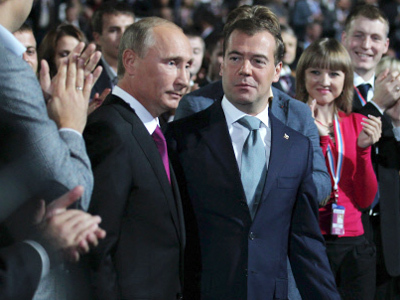 On that there has been much more agreement between Putin and Medvedev,” he concluded. 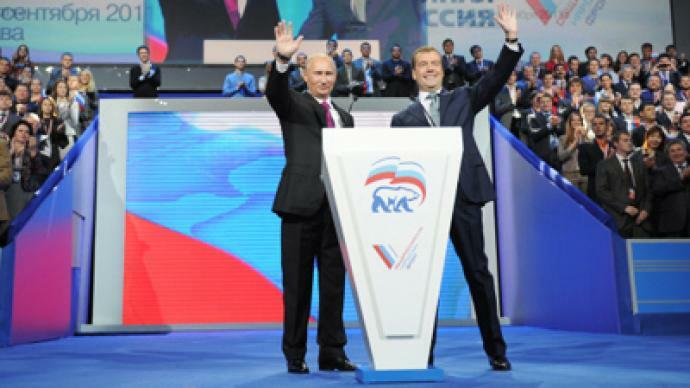 ­Professor Gerhard Mangott, from the Department of Political Science at the University of Innsbruck, shared his opinion on the differences between Medvedev’s and Putin’s approaches to the modernization of Russia. 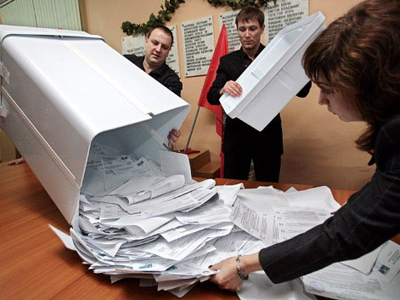 This time, if Putin gets the office, he will have to concentrate on “soft power” and “improve his technique somehow to show that he is not going to just antagonize the minor, but still important groups of the society, but is able to work with them and incorporate them into the political mainstream,” concluded Strokan. 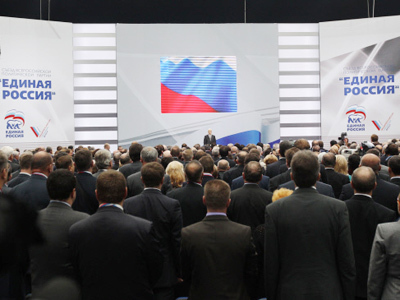 Yaroslavl: the best venue for a presidential announcement? 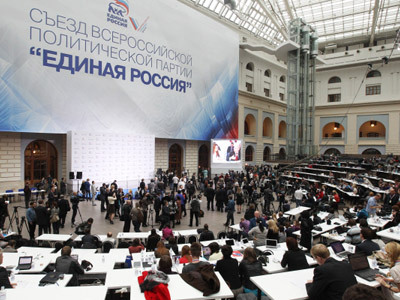 Putin, Medvedev to speak Sunday: who will run?